Amazon.com, Inc. (NASDAQ:AMZN) recently got regulatory approval to buy Whole Foods Market, Inc. (NASDAQ:WFM). But investors haven’t reacted with a cheer. AMZN stock continues to trade softly, and it remains well south of the $1,000-per-share mark. There are several issues with the deal. For one, don’t believe the chatter. Meal kits aren’t likely to be a big winner for Amazon. Furthermore, grocery stores already aren’t very profitable businesses, in general. The company’s move to slash prices at Whole Foods isn’t likely to help matters. More broadly, AMZN stock has always benefited from a seemingly unlimited horizon. Tacking a hyper-competitive, low-profit grocery business onto the parent company isn’t likely to improve the overall operation’s optics. As part of its move into grocery, Amazon also announced that it will be offering customers meal kits. This seemingly comes at an opportune time, as Blue Apron Holdings Inc (NYSE:APRN) recently IPOed. Within this space, only Blue Apron and Hello Fresh currently have much scale or market awareness. So, in theory, there should be room for AMZN to dominate this market. It plays well with the company’s strength. If there is any company good at subscriptions and recurring revenue, it’s Amazon, as Prime’s incredible success so aptly demonstrates. That said, there are reasons to doubt the importance of this market for AMZN stock. For one, it’s a small market, weighing in at just an estimated $1.5 billion in revenues last year. Even with considerable growth, it’d still hardly move the needle for Whole Foods, let alone Amazon. And the market may not grow that much; the top consumer complaint about meal kits is price. AMZN may be able to achieve some scale here. But the fundamental problem, the requirements for fresh produce and tons of packaging for small quantities of many ingredients in each recipe make meal kits inherently inefficient. Amazon certainly dealt a blow to Blue Apron by announcing its expansion into this field. However, it’s unlikely to ever be a major profit center for Amazon and booster for AMZN stock. And meal kit synergies with the Whole Foods acquisition are likely to be limited. AMZN has enchanted investors with huge blue sky potential. The company’s vision of selling virtually everything has made it easy to ignore valuation. AMZN stock has perpetually looked overvalued (at least according to short sellers) based on numerical analysis. What bears have missed, though, is that the market values Amazon almost entirely on where it will be in five or ten years as opposed to its profitability today. However, this comes with great risk. A huge portion of Amazon stock’s valuation comes from the expectation that the company will be free cash flow generating machine in the future. 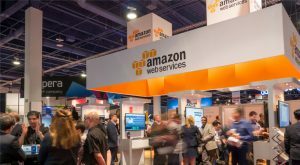 Amazon Web Service’s swing to profitability was so valuable to AMZN stock precisely because it started allowing analysts to project high-profit margin high-growth revenue streams out toward infinity. Grocery, on the other hand, is a low-growth, low-margin business. There is only so much food a person can eat after all; gains come taking share versus rivals, rather than the whole pie expanding. As Whole Foods’ struggles in recent years have shown, it’s hard to stay atop the fast-changing grocery game for long. Even the market leader doesn’t get many spoils. Profit margins tend to be in the low single-digits even for the best-run operations. Among those well-run competitors, we find Wal-Mart Stores (NYSE:WMT). Yes, they may seem stodgy at first glance, but the company has all sorts of successful digital initiatives. Among those, Walmart snapped up a greater than 10% stake in JD.Com Inc(ADR) (NASDAQ:JD), China’s No. 2 online retailer, at a favorable price. Closer to home, WMT has shown surprising agility on the digital front, building a powerful website, bringing in top talent from Jet.com, and ultimately becoming America’s No. 2 e-tailer, only trailing Amazon. All that to say that Walmart has both the deep pockets and online focus necessary to be a major thorn in Amazon’s side within the grocery business. For a sense of that scale, WMT generates enough free cash flow every year to, in theory, pay for the whole Whole Foods deal. That’s compared with AMZN, which essentially runs at breakeven, and had to go to the debt market to fund its purchase. Bulls on the Whole Foods deal are quick to point out that Amazon is getting access to upscale store locations and loyal affluent customers. That’s true. However, most of Whole Food’s stores are leased, there’s no great real estate angle here. AMZN could have built out a similar land package over time on its own, though this deal clearly accelerates things a bit. On the customer front, Amazon is undoubtedly tapping into a desirable consumer base. It’s not clear though if AMZN needed to pay to reach this group. A good chunk of Whole Food’s customers already use Amazon regularly. Even if they didn’t, a competitive food offering from Amazon with organic, natural, and clean foods probably would have picked up plenty of steam on its own. There’s also the argument that Amazon can use the Whole Foods locations as distribution points for other products. That may be so. AMZN has started stocking Echos at Whole Foods stores for now. However, given the space constraint of Whole Foods’ often quite-urban locations, the upside here probably isn’t that high. This deal could be a blockbuster for Amazon. In the past, the market has given AMZN stock the benefit of the doubt in these sorts of open-ended strategic questions. Whole Foods may be the point where investors focus more on math, though. Running physical grocery stores will drag down AMZN’s overall profit margins sharply. Additionally, the deal weighs the balance sheet down with much higher fixed expenses, labor costs and long-term lease obligations. And analysts will find it much harder to make lofty assumptions about both revenues and profit margins soaring exponentially when a large part of the company’s top line is derived from low-upside food sales. Grocery is a defensive business that inherently clashes with Amazon’s world-beating ambitions. If anyone can make it work, Jeff Bezos is probably the person to do it. But AMZN stock may struggle anyways, as investors re-evaluate the new higher-cost, lower-margin Amazon business model. At the time of this writing, Ian Bezek owned JD stock and had no positions in any of the other aforementioned securities. Article printed from InvestorPlace Media, https://investorplace.com/2017/09/amazon-com-inc-amzn-stock-risks/.